As per Google's Quality Rating Guideline, there are four key points of SEO content: Expertise, Authority, Trust and Maintenance. To demonstrate Expertise, publish comprehensive content. To demonstrate Authority, people will share your content through links and mentions. To demonstrate Trust, publish testimonials and examples of your successful projects. When redesigning your website, make sure that you use a theme, fonts and layout that’s easy for mobile users to read. A responsive designed theme will automatically adjust to the screen shape and size of different devices. Sans-Serif fonts like Arial or Veranda are easier to read on smaller screens than the traditional Serif fonts like Times New Roman or Cambria. 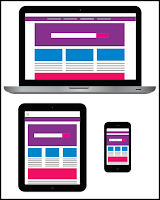 Once you update you website, test your results on multiple devices to make sure your website is conducive for each device format. Consider adding new web pages to your website. Add blog posts to give your opinions. provide current news and information on products in your industry. Content is a great way to make your website more authoritative, and more relevant to the search engines. The search engines are always looking for fresh content on websites. So making changes to existing web pages makes it easier for your website to improve its ranking. Even a few changes to make your information more current is helpful. The goal of search engine optimization (SEO) is to have the search engine spiders (their information search programs) not only find your website and web pages, but also rank the website relevance so that it appears near the top of the search engine results. The process of optimization is not a one-time process, but requires maintenance, tuning, and continuous testing and monitoring. Therefore, it will be a good time to apply some best SEO updates when you plan to update your website. Do a keyword analysis and add those keywords to your content. Update meta tags, alt tags and page titles, as well as update web page URLs (web page address) and your website's site map. Also, submit all web pages to the search engine directories (specifically Google and Bing). Good SEO is more than just these few points, but these are the initial key points to address. Every web page on a website has its own URL. As you reorganize the available web pages in your website, it is possible that you will choose to eliminate web pages and their associated URLs. It may be that a web page is no longer relevant, thus no longer needed. Or, you may combine the content of one or more web pages into another (or a new) web page. A user may try to access a deleted web page because they have it bookmarked. Or, it comes up in a Google search because it is still in the Google index, which is not yet updated. When a user tries to access a delete web page, they will get a "Error 404 - Page not found" message, which is a very unprofessional reception by your website. In your website code or development platform, you can redirect the URL of a deleted web page to another web page. If you have no new web page to replace the use of the deleted web page, then redirect the URL to the Home page of your website. That is a much friendlier result than "Error 404 - Page not found". Very helpful, thank you, David!